A children's party during the summer is just not complete without kids water balloon games. Kids and water just equal summer fun. Water balloons haven't always been a kid's activity, however. History reveals that hunters and gatherers of many years ago used a sort of water balloon. While traditional latex balloons may be used for water balloon fun, it's better to actually use balloons specially designed for water. Regular balloons are typically too large and don't explode on contact as easily. Actual water balloons are the perfect thickness to explode upon contact, but thick enough to easily handled (or thrown). It's easy to fill water balloons. You just need the balloons and a source of water. You can fill them at the kitchen sink, or you can use the garden hose--whichever works better for you. However, keep in mind they do make quite a wet mess when they break, even accidentally, so filling them outside is sometimes better. 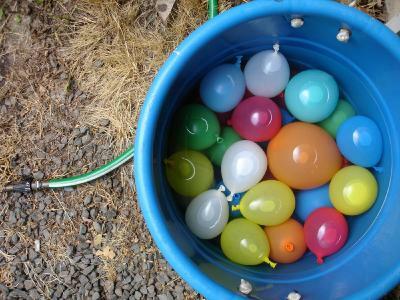 To prepare for this game, 50 water balloons must be filled in advance. The party guests should be divided into teams with two people each. Stand each teammate 10 feet or so apart, facing each other. Each team will be given five balloons. The object of the game is to toss the balloon back and forth to each other without breaking it. The last team with an unbroken balloon wins. Sitting in a large circle, about four feet apart, players toss a water balloon around the circle as the music plays. (The music can be the party host's favorite song.) At various and unpredictable intervals, the music is stopped and started. Each time the music stops, the person who is left holding the balloon is "out." Anyone who gets wet by breaking a balloon is "out," too. The last person in the circle is the winner! This is much like the Water Balloon Toss, but with the added challenge of being blindfolded. Players are split into two-person teams and told to space out, facing each other. One person is the "Thrower" and the other is the "Catcher." The "Catcher" wears the blindfold and is told by the "Thrower" that the balloon has been tossed, when it's about to land and any other information the "Thrower" can give that would be useful to the "Catcher." The team that catches the most intact balloons wins! For this game, it's recommended that players wear garbage bags over their clothes. The garbage bags should have holes cut for arms and the head. Other items needed for this game are disposable razors, shaving cream and, of course, water balloons filled with water. Teams of two are recommended for this game; however, this can be a competition among individuals. The water balloon is covered with shaving cream. The object of the game is to "shave" off the shaving cream from the balloon without popping it. The team, or individual, which gets the closest shave on the balloon wins. Kids of all ages enjoy a good water balloon fight in the heat of summer. Water balloons are great to take to family reunions, camping trips, birthday parties and to the lake. Even though they get you wet, they don't get you dirty or tear your clothes up. Adults may enjoy freezing water balloons before their fights. It's said that frozen water balloons have a bigger explosion and a bit of a sting when they hit their targets. Water balloons can be a great source of fun and excitement to kids on a hot summer day. Just playing with water balloons and having a "fight" or "war" with them is great, but children will really appreciate the planned activity of these kids' water balloon games.